An International Gathering of Clan Sutherland will take place in Scotland from 19th to 22nd July 2018. The Programme of Events and the Attendance Fees are presented on this page. Your Council decided last year that it was appropriate to set aside a budget from our accumulated funds and that these would be used to partially defray the costs of the Gathering for Clan Sutherland Society in Scotland members who are able to attend. As always we will be pleased to be joined by a number of visitors, who are mostly expected to be friends and relatives of members, although others will be welcome. Your Council has set the attendance fees for non-members to meet the cost of their attendance at our events. The eagle eyed will spot that the difference between member and non-member attendance fees exceeds an annual subscription. (Please visit the 'How to join us page' of this website if you wish to join the Society.) The Complete Package option includes all the events, and has been set to be financially attractive for those attending events throughout the Gathering. The fees are given toward the end of this page. 16.00 Registration and welcome café, Dunrobin Castle in the Clan Room. 19.00 Welcome drinks reception, Dunrobin Castle in the gallery at the top of the main staircase; during the reception the first Clan Sutherland Award for Young Citizen of the Year will be presented. 09.30 The Annual General Meeting for members of the Society, Dunrobin Castle in the Fire Engine Room (we will aim to finish by 11.00). Non-members are welcome to explore the castle and gardens while the meeting takes place. 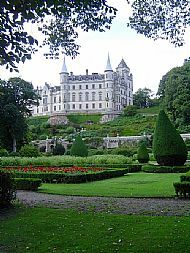 11.30 Tour of Dunrobin Castle (Gathering Attendees will be able to visit the gardens and museum at other times when the castle is open during the day). Afternoon - No formal programme, however there will be a selection from several small independent expeditions in the Golspie area or attendees can plan their own activities. 19.00 Ceilidh, at the Golspie Inn, Golspie with music from the Rogart Ceilidh Band. The ticket price includes a light supper which will be provided during the evening. 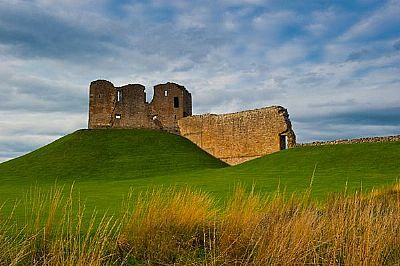 09.30 All-day bus tour to various locations with historic connections to Clan Sutherland (Battle of Auldearn, Duffus Castle, City of Elgin, Culloden Battlefield Visitor Centre) The ticket price includes the coach trip, lunch and entry to the Culloden Visitor Centre exhibition and battlefield. 19.30 Dinner at the Marine Hotel, Brora. This will be informal and therefore full Highland dress need not be worn though an element of tartan would be appreciated. Our Honorary Vice-President Maestro Iain Sutherland will speak after dinner. 12.30 Farewell Lunch, at the Dornoch Castle Hotel, Dornoch. A booking form is available on a separate page of this website which you can download, complete and email to make a booking (send to info@clansutherland.org.uk). It would be helpful if you can do this as soon as you know you will be attending the Gathering, and in any case in order to arrive before Monday July 16 at the latest. All payments may be made at registration on the afternoon of Thursday July 19 at Dunrobin Castle either by cash (£sterling) or by cheque (£sterling). We will be unable to accept payments in other currencies, by PayPal or by credit card. (PLEASE DO NOT SEND CASH BY POST).